Activating Your Inner Champion will help you identify which types of Critic are problems for you, how they operate, and their underlying reasons for attacking you. This already gives them less power over you. The book shows you how to evoke your Inner Champion to change the way you relate to yourself. It is a magic bullet for dealing with the negative impact of your Inner Critic. Your Inner Champion supports you in being yourself and feeling good about yourself in the face of Inner Critic messages. Do you struggle with bouts of depression and low self-esteem? Do you feel ashamed, guilty, or hopeless at times? Many of us go through periods of believing there is something inherently wrong with us. This book will show you that your low self-esteem isn’t really valid. It comes from attacks by your Inner Critic. This part of you is responsible for your feelings of worthlessness. When you feel ashamed, hopeless, inadequate, or just plain awful about yourself, it’s because your Inner Critic is attacking you. It has a variety of methods, but most commonly, it works by hammering you with negative messages about your self-worth. The Inner Critic judges you, demeans you, and tells you who you should be. It undermines your self-confidence and makes you feel bad about yourself. 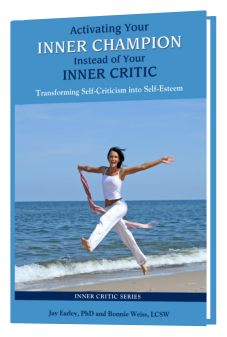 Since this is one of the most difficult and tenacious issues that people face, we have collaborated on a serious study of how to work with and transform your Inner Critic. Our core understanding is that self-esteem is your birthright. You deserve to feel good about yourself without having to earn it. However, we’ve all had the experience of feeling bad about ourselves. Think of those times when you felt down and believed that you were worthless, stupid, incompetent, and so on. That wasn’t the truth about you—it was a message from your Inner Critic. We have identified seven types of Inner Critics. Each one judges you about something different. One judges you for not being perfect. Another makes you feel guilty. A third undermines your sense of confidence. Most people don’t just have one Critic but several. Activating Your Inner Champion will help you identify which types of Critic are problems for you, how they operate, and their underlying reasons for attacking you. This already gives them less power over you. The book shows you how to evoke your Inner Champion to change the way you relate to yourself. It is a magic bullet for dealing with the negative impact of your Inner Critic. Your Inner Champion supports you in being yourself and feeling good about yourself in the face of Inner Critic messages. There is a different type of Inner Champion for each of the seven types of Inner Critics. Activating Your Inner Champion will help you get in touch with the specific Inner Champions you need for those types of Inner Critics that are the biggest problems for you. Then you can activate those Champions when you need them in the face of an Inner Critic attack. The adage “You can love yourself” is not just a platitude. This book shows you how to do exactly that. You aren’t stuck with the anguish and difficulties that stem from your Inner Critic. Your inner world can change so that you feel confident and worthwhile, allowing your life journey to unfold in an exciting way. Your Inner Champion will support you and help you to feel good about yourself. It will help you to recognize your intrinsic self-worth and develop your self-confidence. It will encourage you to be who you truly are rather than trying to fit into the box your Inner Critic creates for you. It will support you in living a life of freedom and joy. This book is based on the Pattern System, a comprehensive and detailed map of the human psyche.